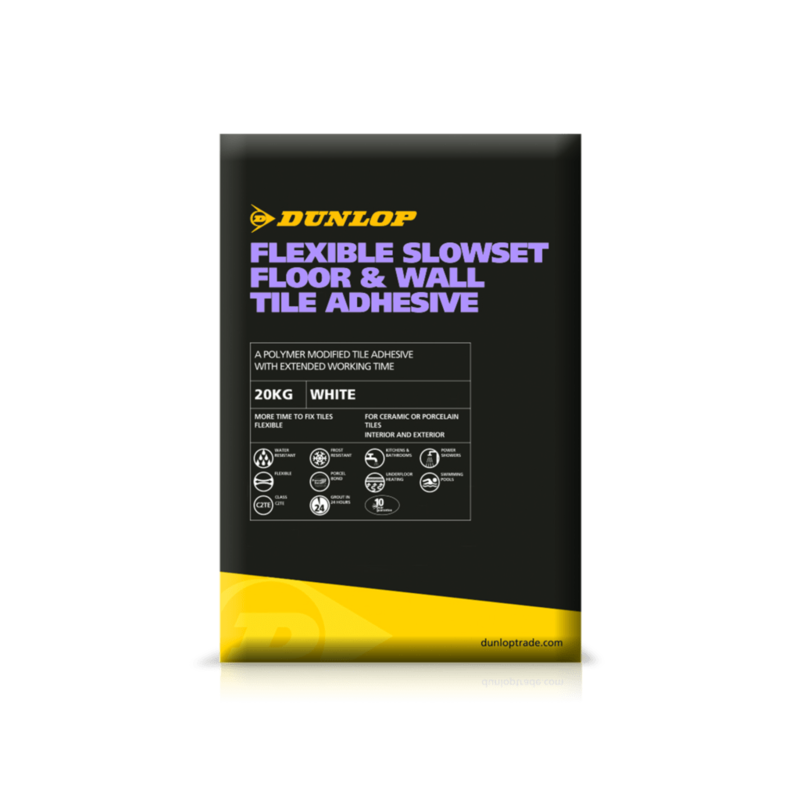 DUNLOP FLEXIBLE SLOWSET FLOOR & WALL TILE ADHESIVE is a water-resistant powder-based tile adhesive for use in internal and external areas. Mixed with water, it is suitable for fixing floor and wall tiles including porcelain, mosaics, quarry and brick slips. Tiles can be adjusted for up to 20 minutes after positioning making this perfect for fixing large format or tiles which are difficult to set out. The adhesive is fully set and tiles are ready for grouting after 24 hours. The set adhesive is frost and water-resistant and can be used in showers, or under continuous immersion such as swimming pools. Exceeds the requirements of BS EN12004 for a C2TE adhesive. Depends on the nature and flatness of the surface and the method of application, but on a level background the amount of adhesive required at 3mm thickness will be: approx. 2kg/m2 for dry wall areas, and approx. 4kg/m2 for floors, exterior and wet areas.